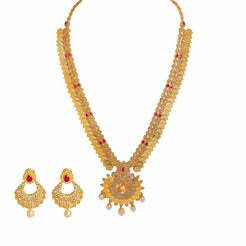 22K Yellow Gold Necklace & Earrings Set W/ Kundan, Pearl & Engraved Details on Crescent Choker for women. 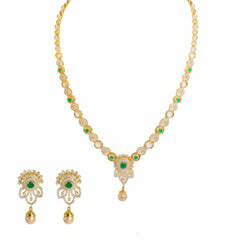 This decadent set features a crescent choker embellished with kundan, hanging pearl and an engraved detailed necklace. The necklace is 14" long with a width range of 2-8 mm. Its pendant is 42 mm long and 27 mm wide. Each earring is 45 mm long and 18 mm wide. The set weighs a total of 43.8 grams. Wear it to add the finishing touch on your dressy attire for your next special affair.